In terms of sport, from growing up in Belfast during the “troubles” I was witness to bitter and divisive nature of sport, but also, fleetingly, its capacity to cross the sectarian divide through a football team made up of both Protestants and Catholics called ‘Belfast United F.C.’ I left Belfast at 10 but returned for a Masters in Ethnic Conflict at Queens while working for ‘Football for Peace International’; an NGO that used football to forge cross community partnerships in Israel/Palestine through building ‘Imagined Communities’ through sport. This formed the basis of my research and the idea which has taken fruit all over the world in hundreds of sport for peace projects. I have personally been involved in researching sport in divided societies in Israel/Palestine, South and West Africa, Northern Ireland and Fiji. Diverse locales, but connected in the privileged place that sport has in culture and society. In Israel/Palestine for example, despite vitriol on both sides of the Jewish/Arab divide, both communities share the love of football. While facilitating and coordinating projects in Jerusalem I bore witness to Arab and Jewish kids (11-15) playing together, at the beginning very reluctantly, but eventually forging real friendships realised and augmented through sport. 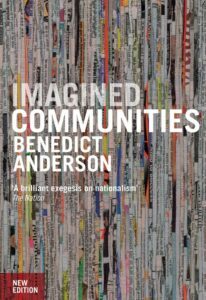 This is not necessarily about building lasting friendships across ethnic divides, but about humanisation – the realisation that ‘the other’ is not so different after all. This is difficult to achieve, as peacebuilding discourse and research will attest. Yet the potential of sport in breaking down barriers is now well known, and as many areas of the globe face urgent questions around migration, resettlement and ‘integration’ – however it may look. At Edge Hill we are beginning to apply the same ideas to help find solutions to some of these questions. 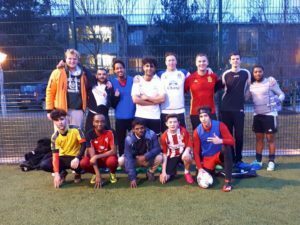 By organising football games between and among refugees that have been resettled from a collection of nations, such as Eritrea, Iran, Syria, Iraq…along with students and staff from Edge Hill. What we have begun is a process of mutual learning and understanding that can be facilitated through sport. For the refugees these games are something to do that costs nothing: many have to live on less than £5 per day. It is also a chance for them to get to know young people from the North West and work on their English. Opportunities for both are in short supply. This process is not one way however, it is dialogical, in exposing student and staff to refugees with diverse backgrounds and stories. We hope to improve their cultural capital and global knowledge. From a sports perspective, students are exposed to the potential of sport outside of its more traditional roles in strength and conditioning, for example. Educators, sociologists, historians and so on, can gain access to diverse individuals and life histories that inform their development as teachers, scholars and people. Beginning a new academic year we hope to expand the number of games (last year we managed 10) and the scope of those involved (we see the inclusion of women as a key priority). All with the continued aim to build more inclusive and real community at Edge Hill. This entry was posted in education and training, research, sport and tagged campus, football, HE Access, language, sport for peace, understanding by Charlotte Hastings. Bookmark the permalink.